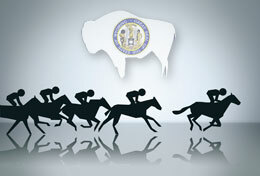 Wyoming Commissioners approved the request by Wyoming Horse Racing to amend the live race dates at Sweetwater Downs. CASPER, WY—FEBRUARY 11, 2019—During the Wyoming Pari-Mutuel Commission meeting held Friday (Feb. 8) in Casper, Commissioners approved the request by Wyoming Horse Racing to amend the live race dates at Sweetwater Downs. Wyoming has scheduled a total of 30 Live Race Days for 2019. Wyoming Horse Racing, LLC will still run 16 days total throughout the state but Sweetwater Downs will start a week earlier than originally requested. Energy Downs in Gillette, Wyoming will run 9 days; June 14, 15, 16, 21, 22, 23, 28, 29, 30. Sweetwater Downs in Rock Springs will run 7 days; August 23, 24, 25, 30 September 1, 7, 8. CLICK HERE for the revised 2019 Wyoming race dates.